DAF manufactures its industry-leading trucks in world class facilities in Eindhoven (The Netherlands), Westerlo (Belgium), Leyland (United Kingdom) and Ponta Grossa (Brasil). DAF's engine factory, component plant, press shop and final assembly line for CF and XF models are located in Eindhoven. Axles and cabins are produced in Westerlo. Leyland Trucks (a PACCAR company) produces the company's LF series of light and medium duty trucks, as well as CF and XF vehicles. DAF products are sold and serviced by a network of over one thousand independent dealer locations throughout Europe, the Middle East, Africa, South America, Australia, New Zealand and Asia. More and more transport companies are operating internationally. That requires a uniform dealer network, so that we can best serve our customers. The DAF dealer network is a quality organization behind a quality product. DAF has about 1,000 representatives in Europe and beyond, consisting of DAF Dealers™ and DAF Service Partners™ (many of whom do both). One-stop shopping is the principle in that case, meaning you you can find everything you need for your fleet at one address, whether it be buying a new or used truck, financing, maintenance and repair contracts, parts and accessories, or maintenance and repair of related equipment and components like tail lifts, cooling aggregates and cranes. DAF Dealers™ are geared towards the sale of new and used vehicles. The sales people are transport consultants, who use the most modern software and vast knowledge and experience to determine precisely the specifications required for a specific use. Once a vehicle’s specifications are finished, it is ordered directly from DAF in Eindhoven. After that, information is always available on-line regarding the status and delivery time of the vehicle ordered. DAF Service Partners™ are at the ready to help you with everything to do with maintenance and repair. They have the most advanced DAVIE diagnostic equipment and highly qualified service staff. They can help you with the maintenance and repair of other truck makes, as well. As part of the ‘TRP Programme’, DAF Service Partners™ stock universal parts. Even if you handle maintenance of your fleet yourself, your DAF dealer is the partner for you. Not just for supply of DAF parts, but also for your workshop consumables and tools and parts for trailers, tail lifts and body. Besides DAF Dealers™ and DAF Service Partners™, in a limited number of countries you will also find DAF Service Support Points™ that operate in conjunction with DAF Service Partners™ to meet your maintenance and repair needs. DAF also has a network of 150 specialised 'DAF Coach & Bus Service' partners strategically situated along the main routes in Europe. They are geared towards maintenance and repair of specific coach components, such as toilet facilities, catering and on-board audio and video equipment. In all other European countries and a number of markets outside Europe, DAF Trucks is represented by independent distributors. To be able to offer its customers optimum service, DAF operates an international network of around 1,000 dealers and service points. DAF utilizes the innovative PACCAR Production System (PPS) in its manufacturing operations. in DAF's engine factory, employees receive standardized work instructions on PC workstations. 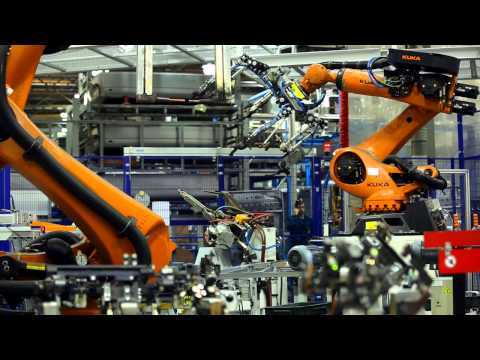 Robots are used to enhance assembly accuracy and factory ergonomics. At DAF's components factory skilled workers use advanced welding robots and laser cutting machines to produce a wide range of cab, chassis and axle parts. Ultramodern CNC-controlled machines and welding robots have been installed at the Westerlo cab and axle factory to continuously improve quality. The Leyland assembly plant is a highly modern facility producing the DAF LF series, as well as CF and XF models. DAF Trucks is constantly increasing quality and efficiency. Within the PACCAR Production System, there is a continuous effort to do everything right the first time, without waste of energy and materials and with the best quality. The knowledge and skills of DAF employees, together with the PACCAR Production System, form the basis for continuous process improvement. The result is a world-class product produced in a world-class factory by world-class people. DAF is an environmental leader, offering a full range of fuel efficient and ultra clean diesel engines, including a full range of new engines meeting the stringent Euro 6 emission standard. DAF was among the first European truck manufacturers to comply with the ISO 14001 standard for environmental care. All production facilities have achieved ‘Zero Waste to Landfill’.